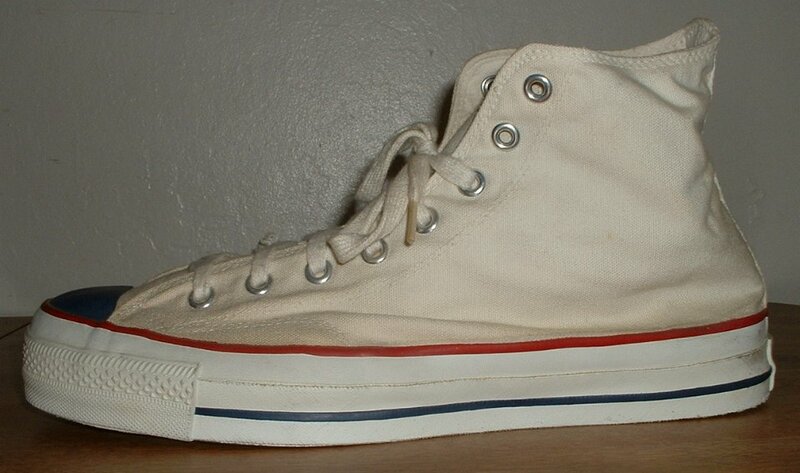 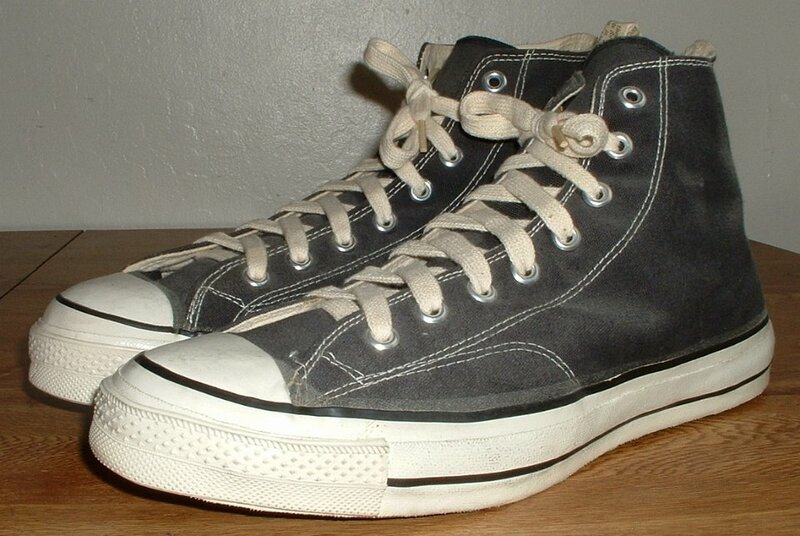 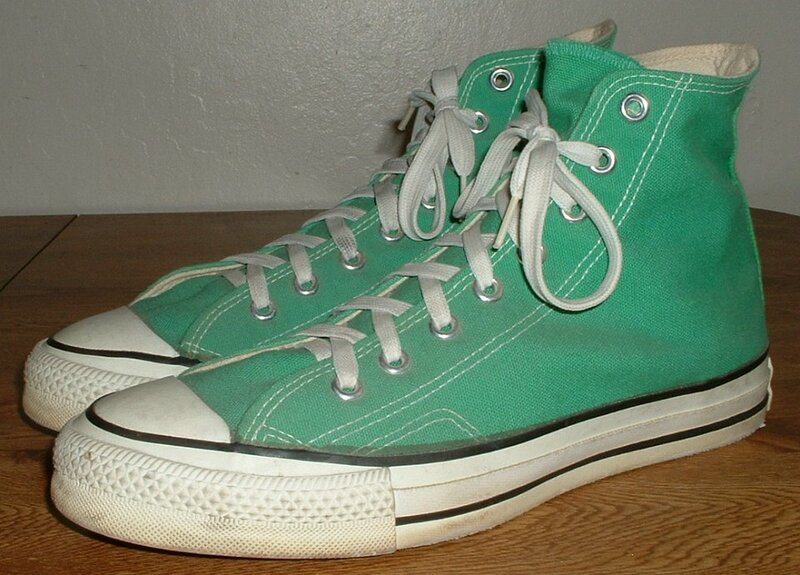 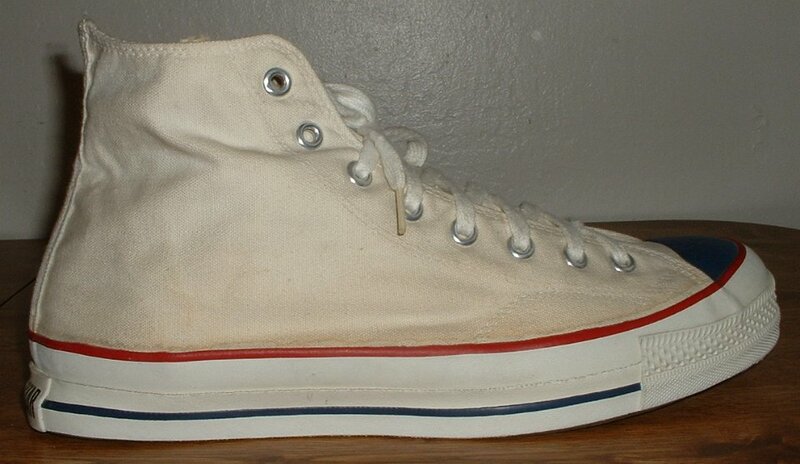 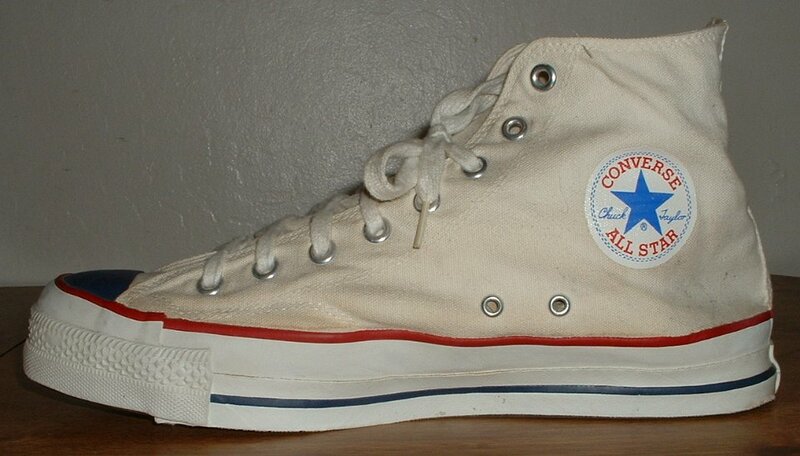 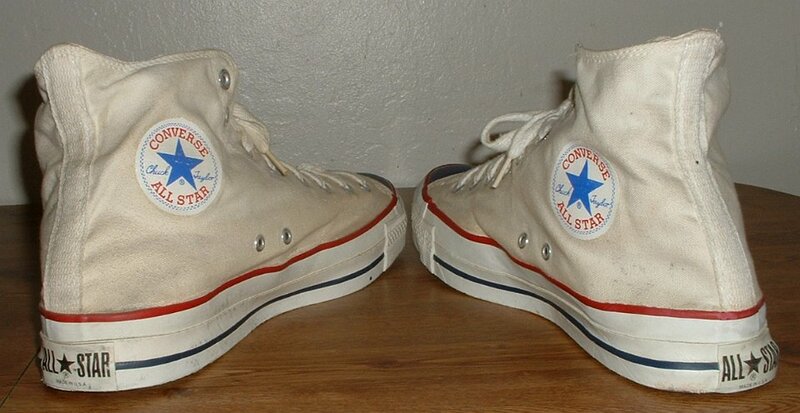 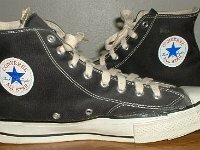 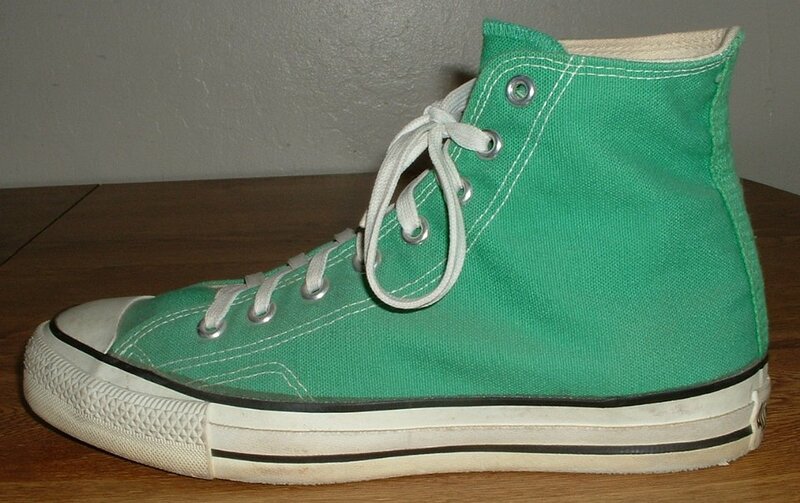 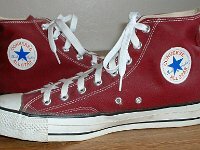 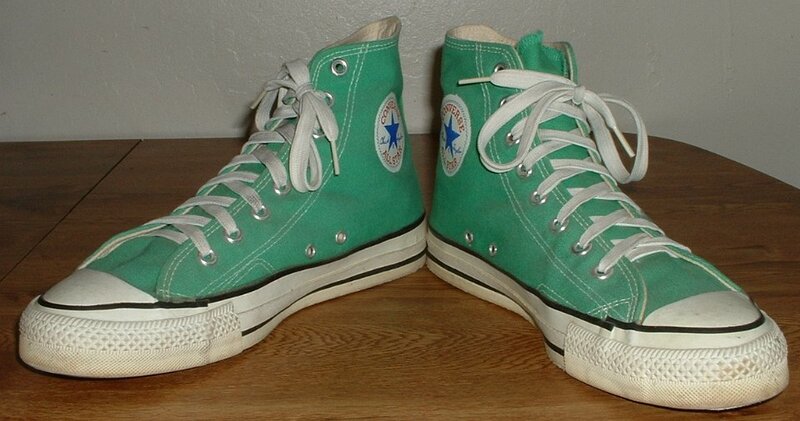 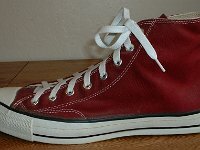 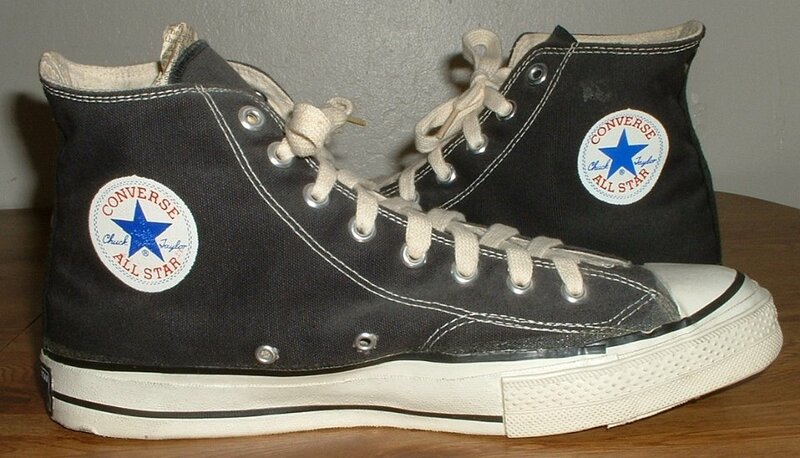 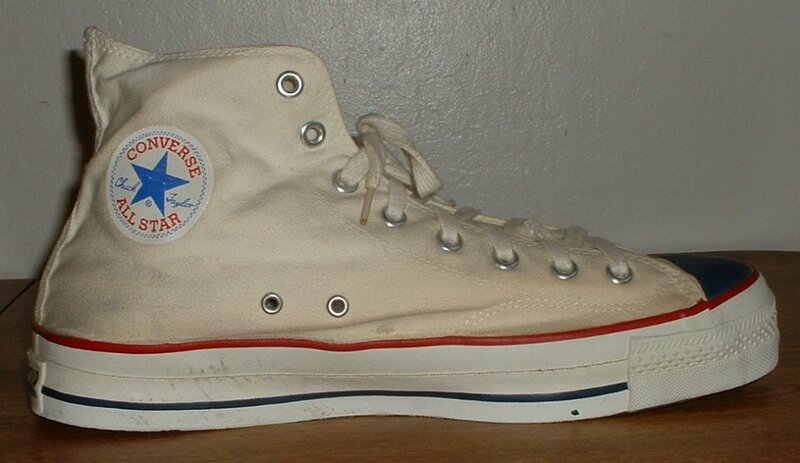 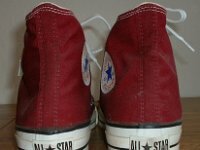 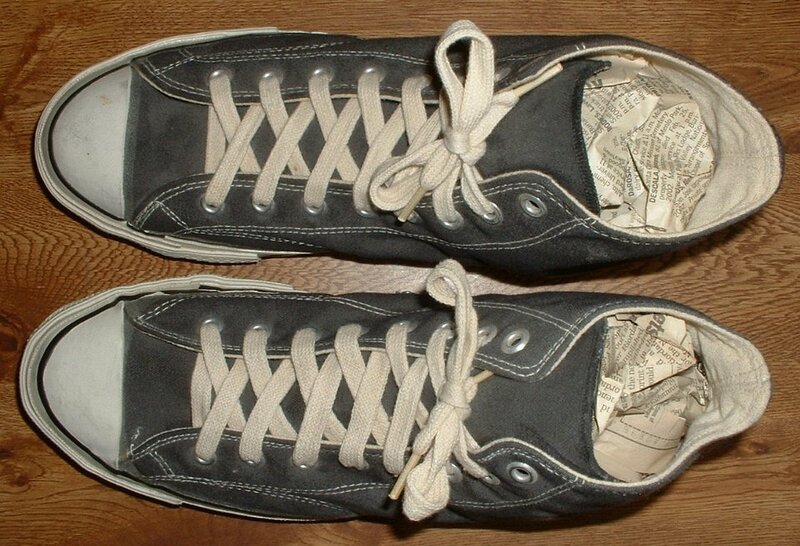 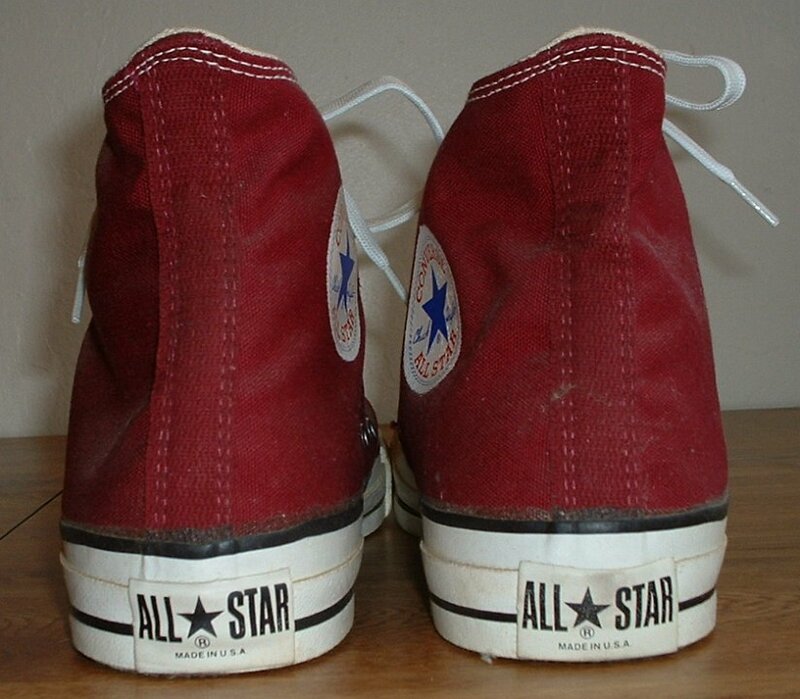 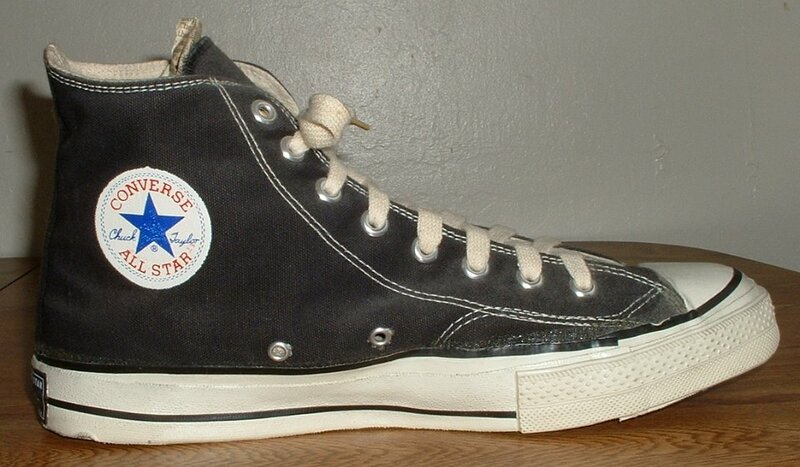 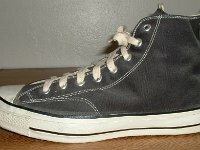 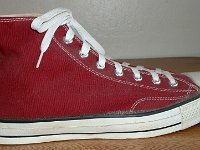 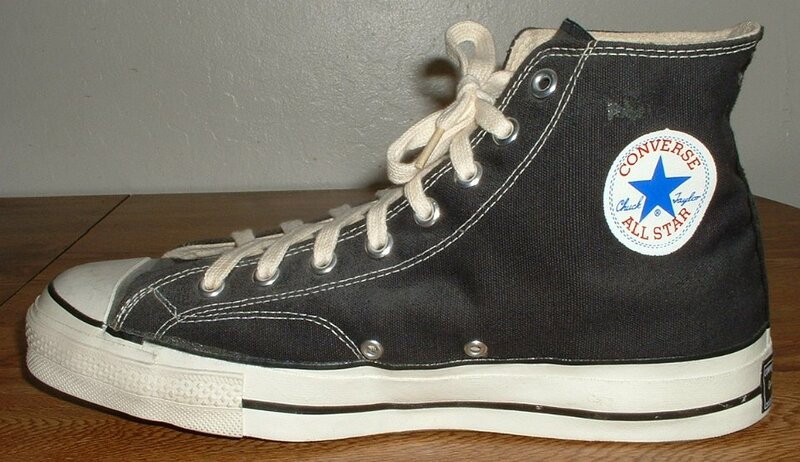 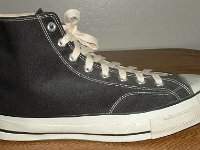 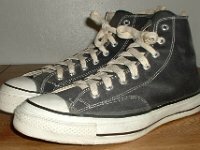 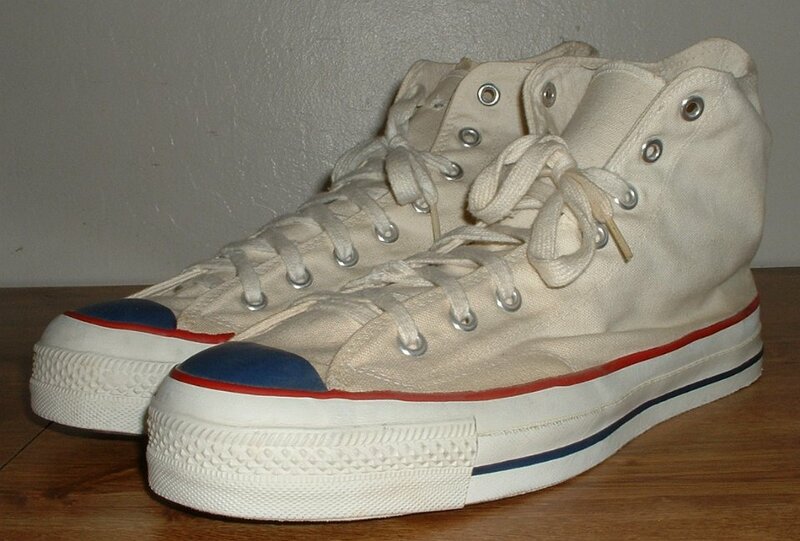 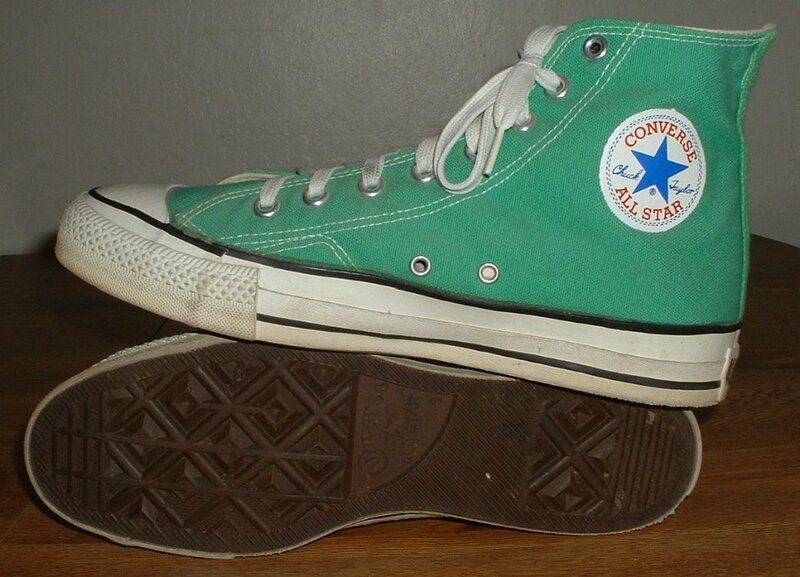 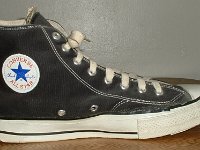 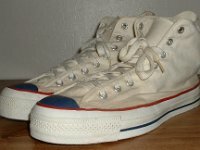 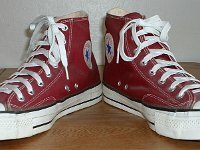 Photo gallery of vintage pairs of high top chucks from Mark Recob's collection. 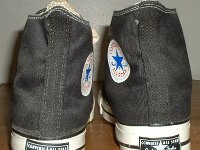 1 Mark Recob Vintage Chucks Collection Inside patch view of a right black vintage Chuck Taylor All Star. 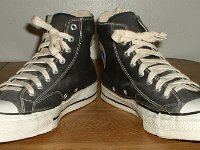 2 Mark Recob Vintage Chucks Collection Outside view of a right black vintage Chuck Taylor All Star. 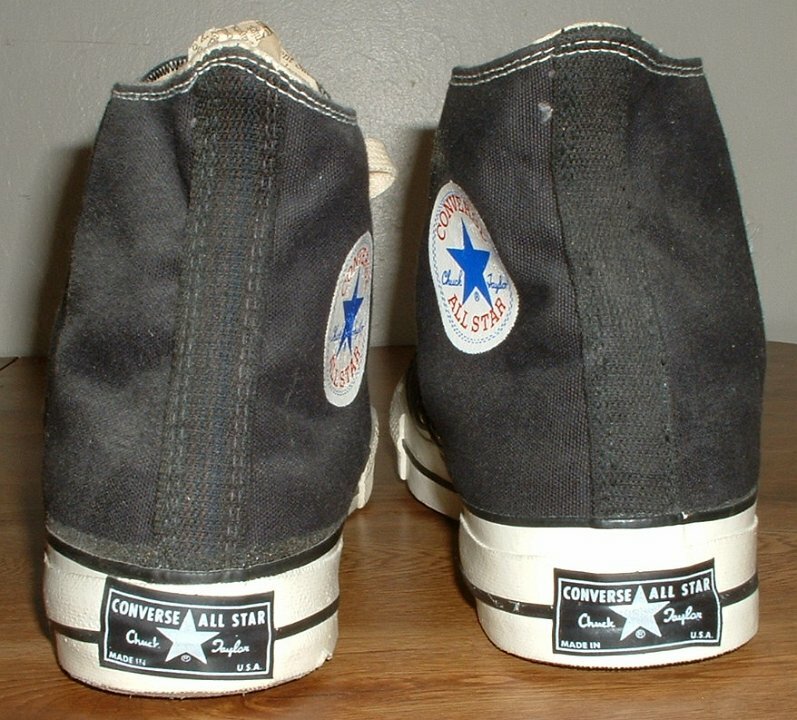 3 Mark Recob Vintage Chucks Collection Inside patch view of a left black vintage Chuck Taylor All Star. 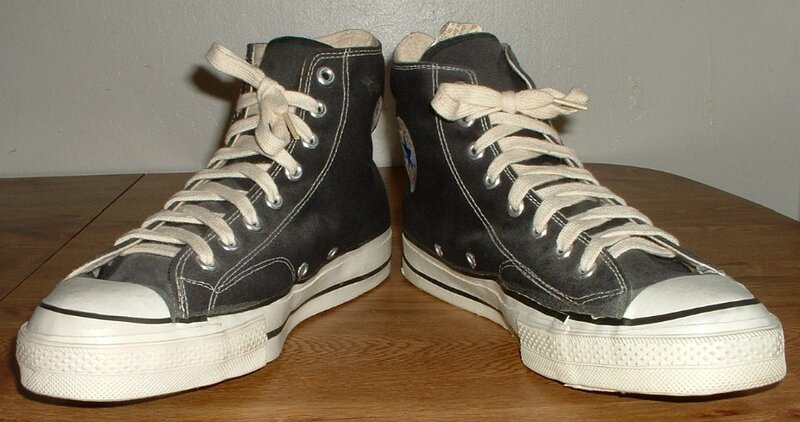 4 Mark Recob Vintage Chucks Collection Outside view of a left black vintage Chuck Taylor All Star. 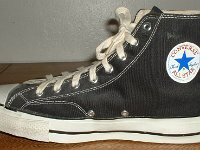 5 Mark Recob Vintage Chucks Collection Rear view of black vintage Chuck Taylor All Star high tops with black heel patch. 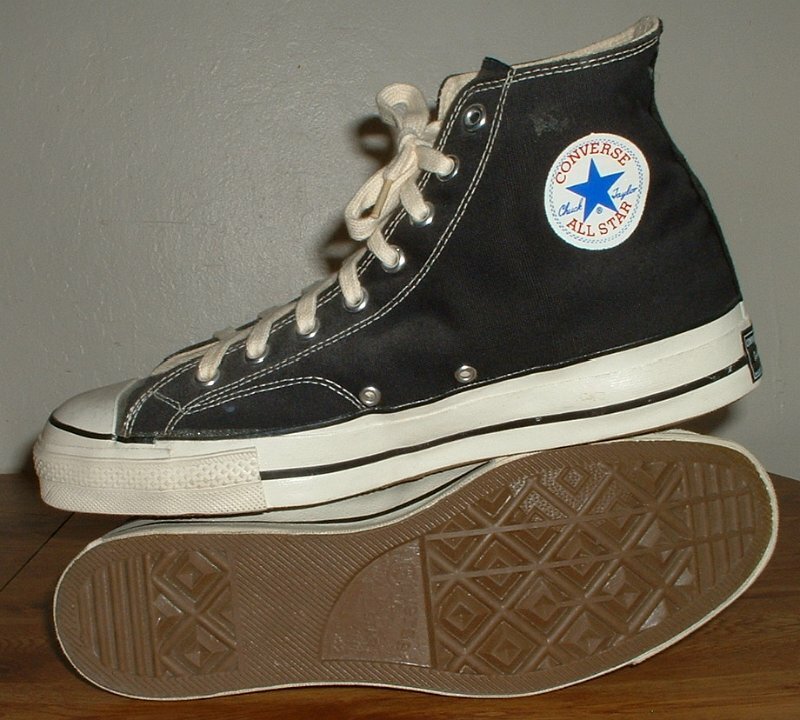 6 Mark Recob Vintage Chucks Collection Angled rear view of black vintage Chuck Taylor All Star high tops with black heel patch. 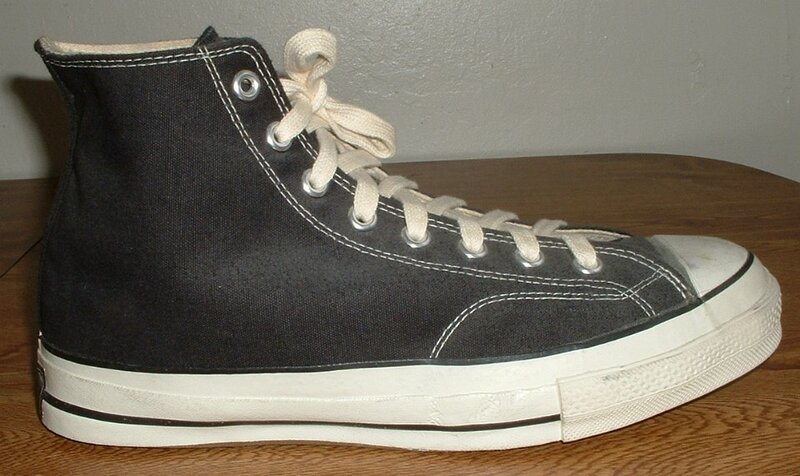 7 Mark Recob Vintage Chucks Collection Angled side view of black vintage Chuck Taylor All Star high tops. 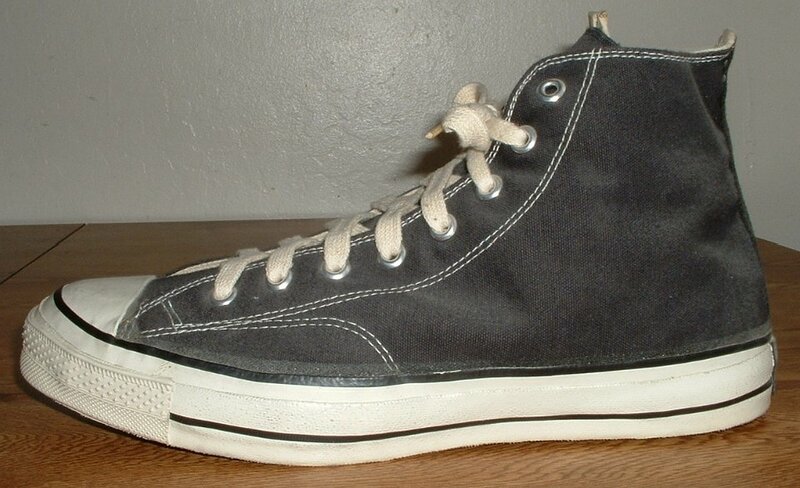 8 Mark Recob Vintage Chucks Collection Angled front view of black vintage Chuck Taylor All Star high tops. 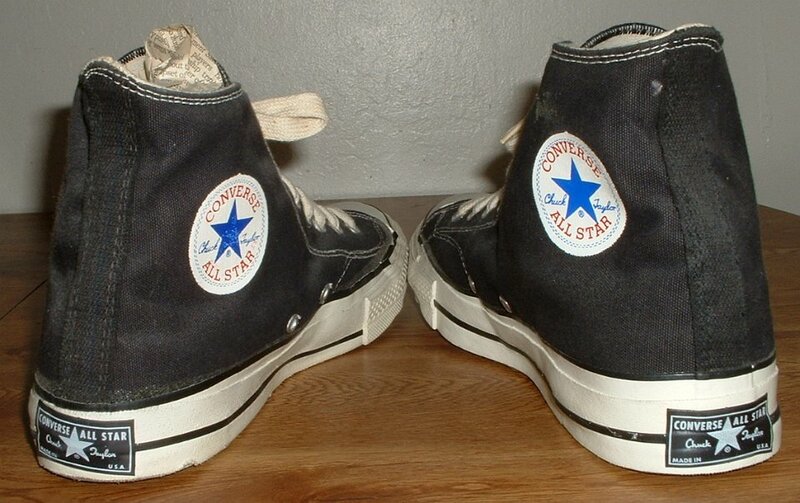 9 Mark Recob Vintage Chucks Collection Top view of black vintage Chuck Taylor All Star high tops. 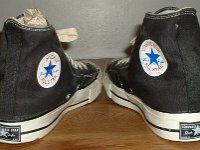 10 Mark Recob Vintage Chucks Collection Inside patch views of black vintage Chuck Taylor All Star high tops. 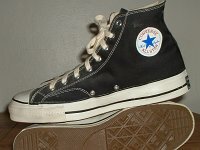 11 Mark Recob Vintage Chucks Collection Inside patch and sole views of black vintage Chuck Taylor All Star high tops. 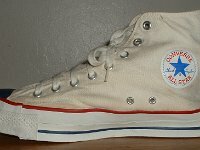 12 Mark Recob Vintage Chucks Collection Inside patch view of a left white weighted blue toe vintage Chuck Taylor All Star. 13 Mark Recob Vintage Chucks Collection Outside view of a left white weighted blue toe vintage Chuck Taylor All Star. 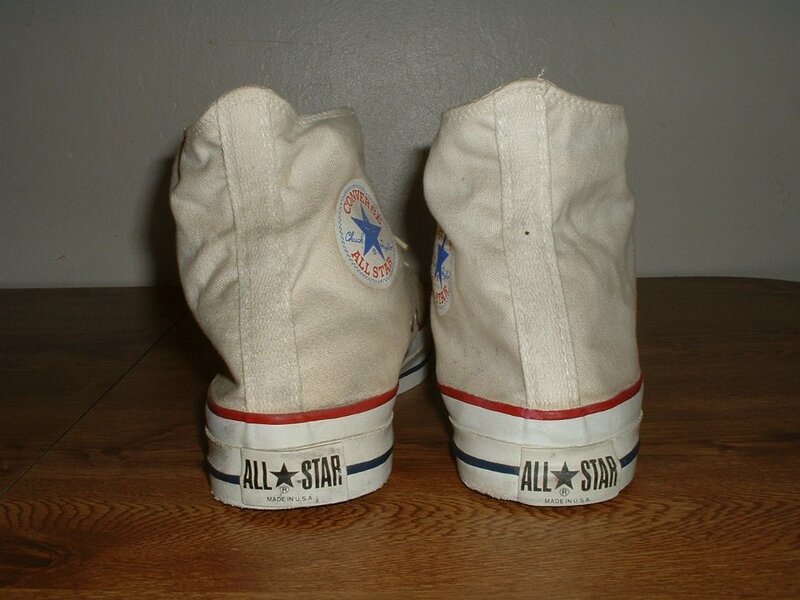 14 Mark Recob Vintage Chucks Collection Inside patch view of a right white weighted blue toe vintage Chuck Taylor All Star. 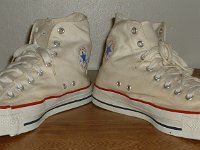 15 Mark Recob Vintage Chucks Collection Outside view of a right white weighted blue toe vintage Chuck Taylor All Star. 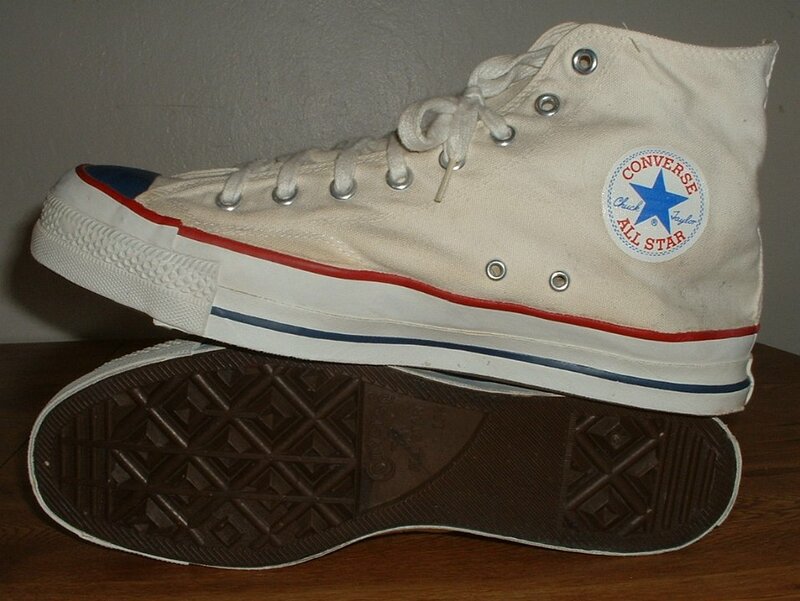 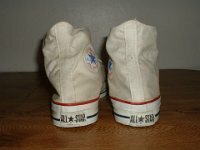 16 Mark Recob Vintage Chucks Collection Rear view of white weighted blue toe vintage Chuck Taylor All Star high tops. 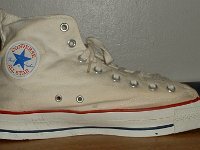 17 Mark Recob Vintage Chucks Collection Angled rear view of white weighted blue toe vintage Chuck Taylor All Star high tops. 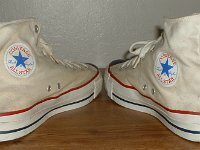 18 Mark Recob Vintage Chucks Collection Angled side view of white weighted blue toe vintage Chuck Taylor All Star high tops. 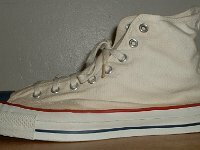 19 Mark Recob Vintage Chucks Collection Angled front view of white weighted blue toe vintage Chuck Taylor All Star high tops. 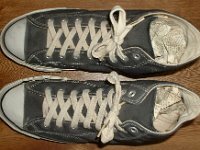 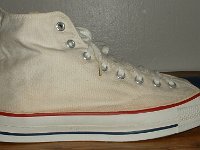 20 Mark Recob Vintage Chucks Collection Inside patch and sole views of white weighted blue toe vintage Chuck Taylor All Star high tops. 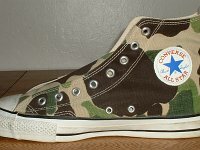 21 Mark Recob Vintage Chucks Collection Inside patch view of a left olive drab camouflage vintage Chuck Taylor All Star. 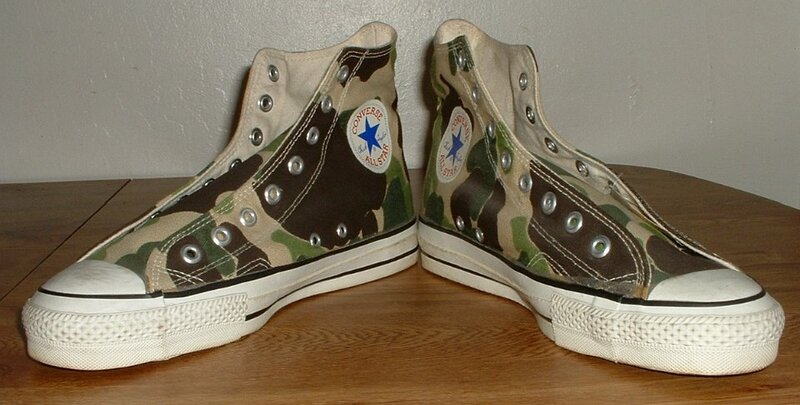 22 Mark Recob Vintage Chucks Collection Outside view of a left olive drab camouflage vintage Chuck Taylor All Star. 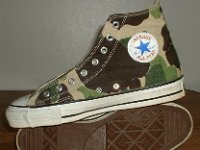 23 Mark Recob Vintage Chucks Collection Outside view of a right olive drab camouflage vintage Chuck Taylor All Star. 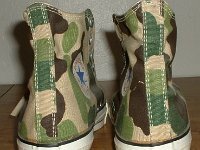 24 Mark Recob Vintage Chucks Collection Inside patch view of a right olive drab camouflage vintage Chuck Taylor All Star. 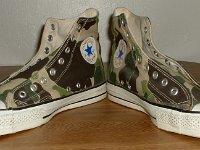 25 Mark Recob Vintage Chucks Collection Front view of olive drab camouflage vintage Chuck Taylor All Star high tops. 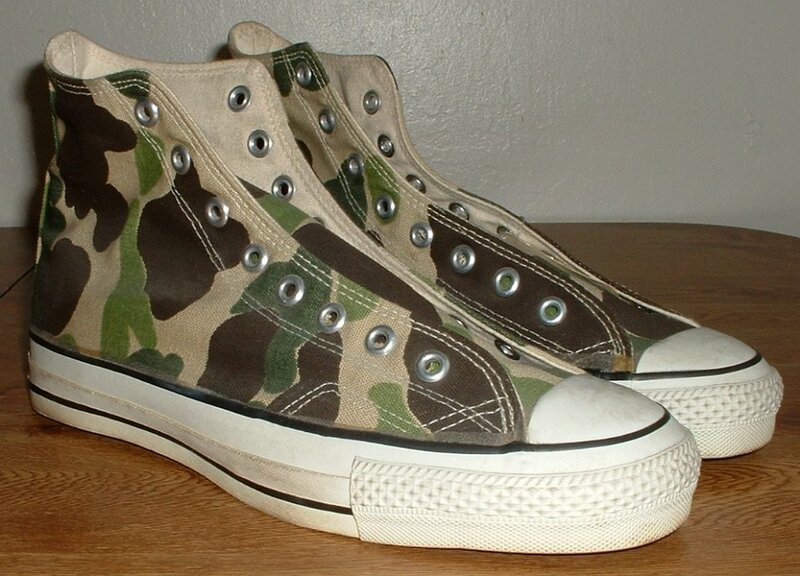 26 Mark Recob Vintage Chucks Collection Rear view of olive drab camouflage vintage Chuck Taylor All Star high tops. 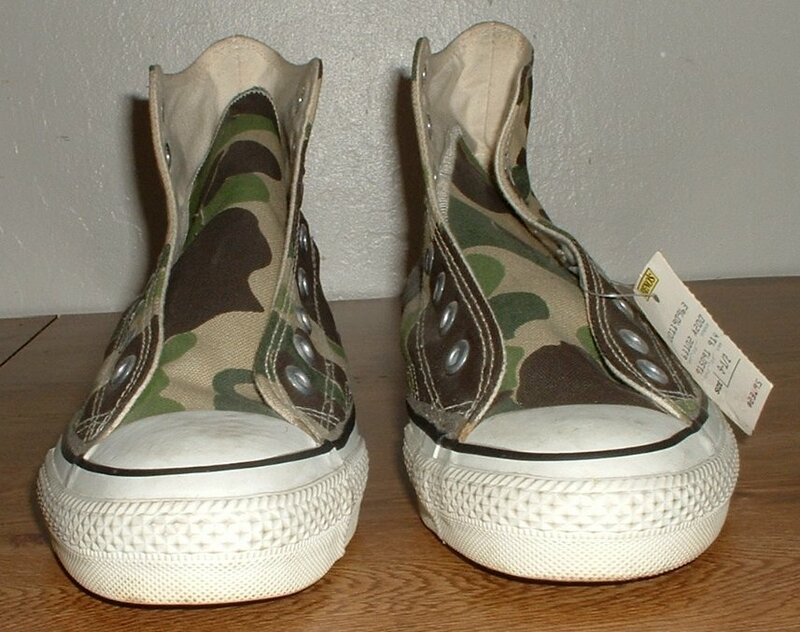 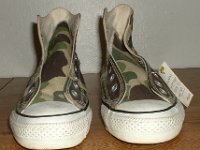 27 Mark Recob Vintage Chucks Collection Angled rear view of olive drab camouflage vintage Chuck Taylor All Star high tops. 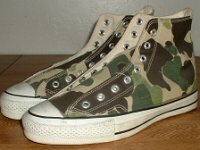 28 Mark Recob Vintage Chucks Collection Top view of olive drab camouflage vintage Chuck Taylor All Star high tops. 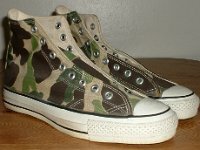 29 Mark Recob Vintage Chucks Collection Angled side view of olive drab camouflage vintage Chuck Taylor All Star high tops. 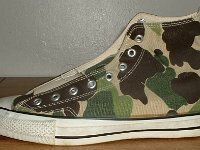 30 Mark Recob Vintage Chucks Collection Angled side view of olive drab camouflage vintage Chuck Taylor All Star high tops. 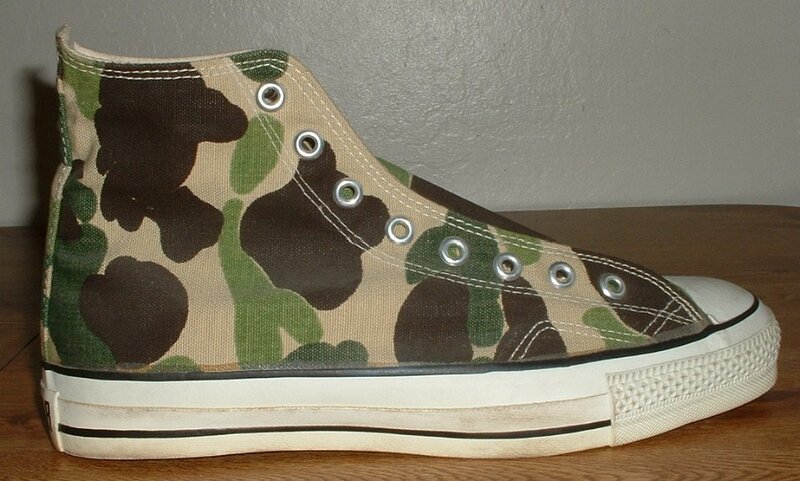 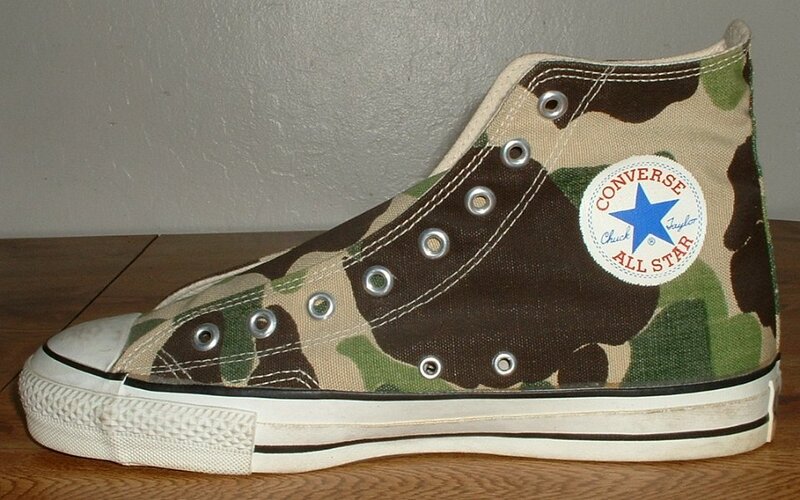 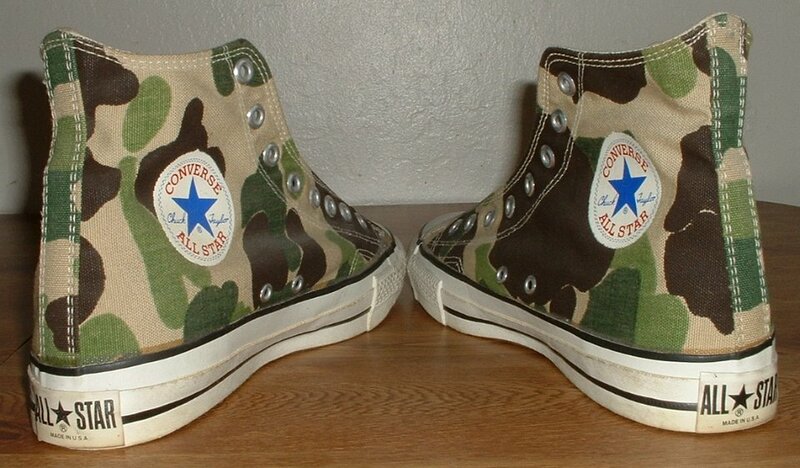 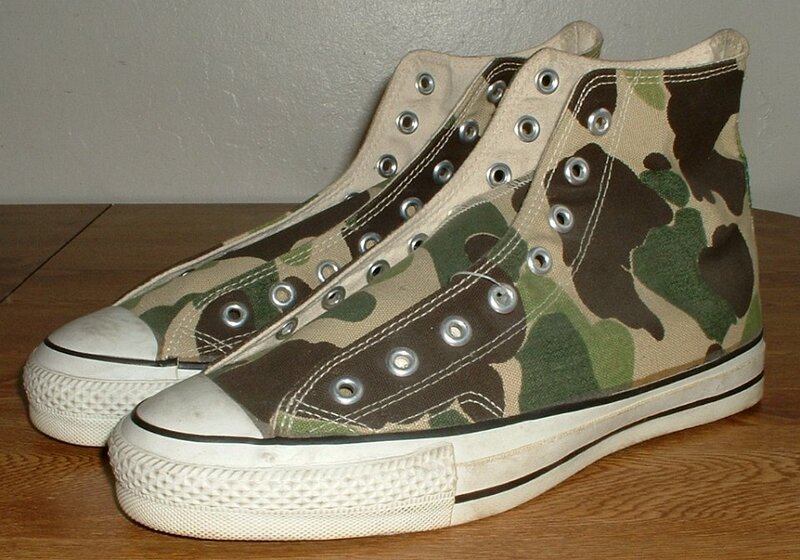 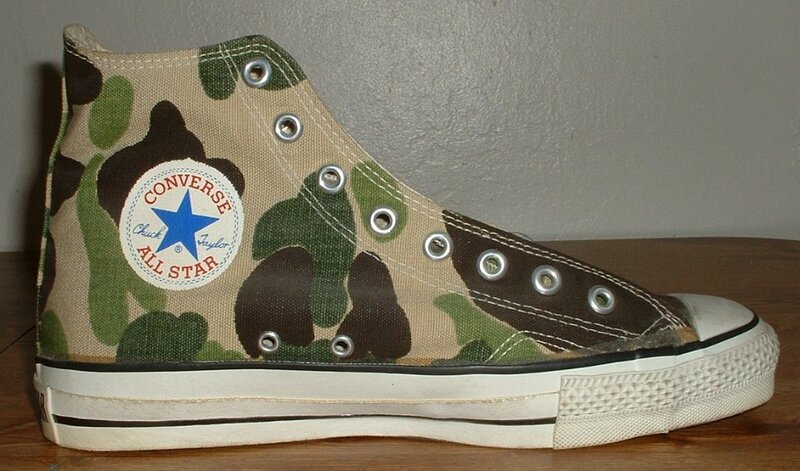 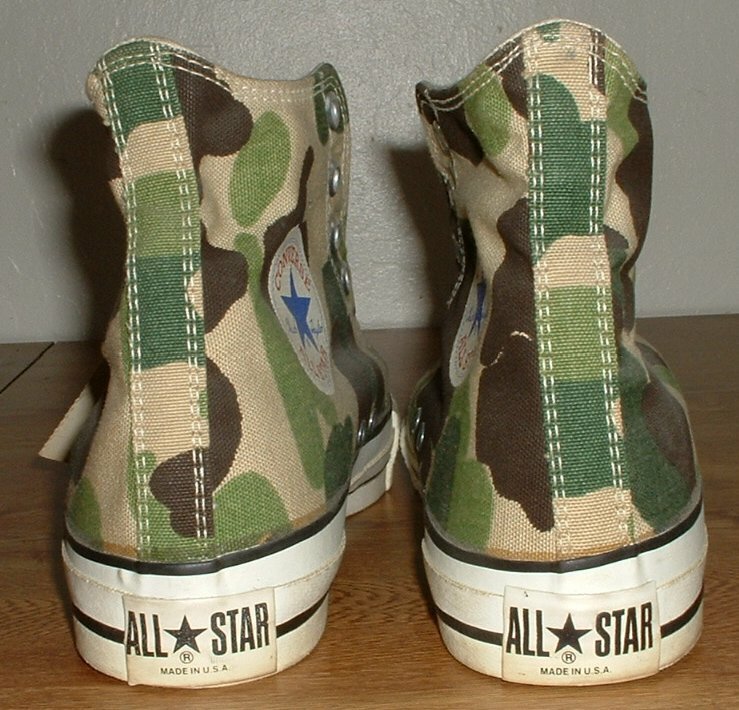 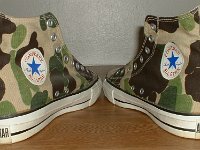 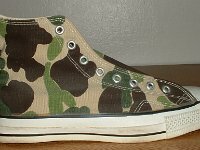 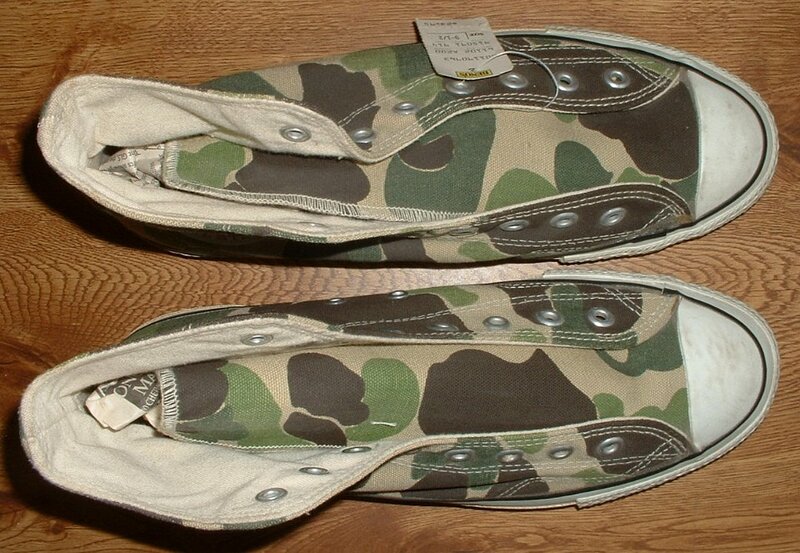 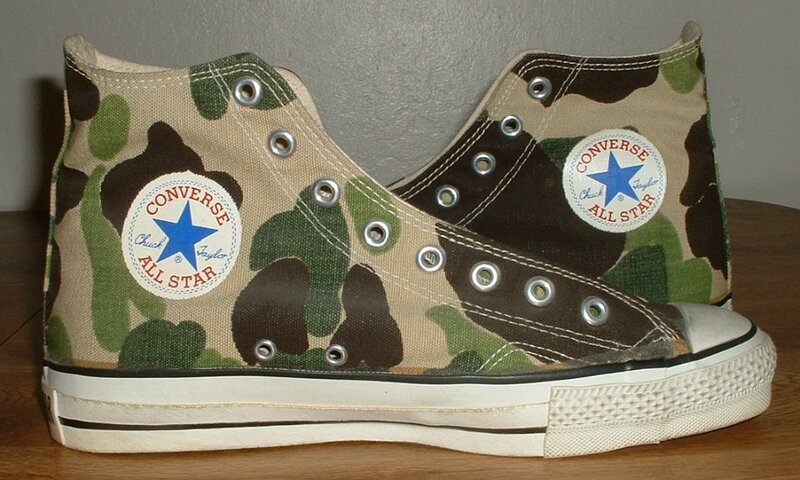 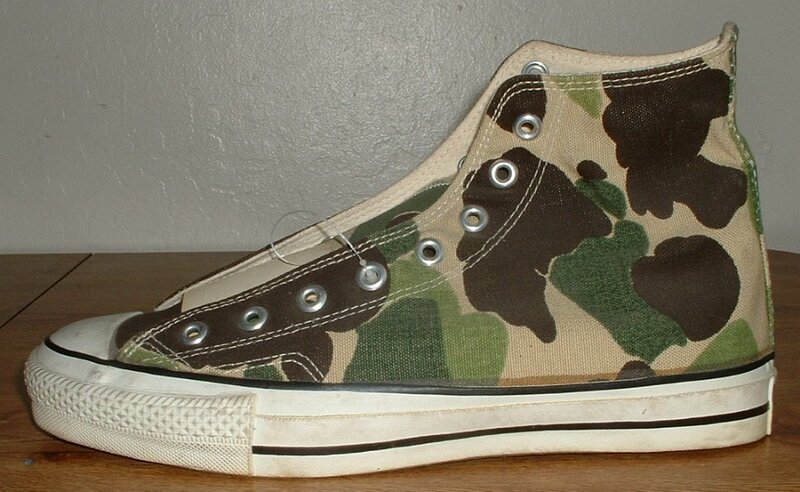 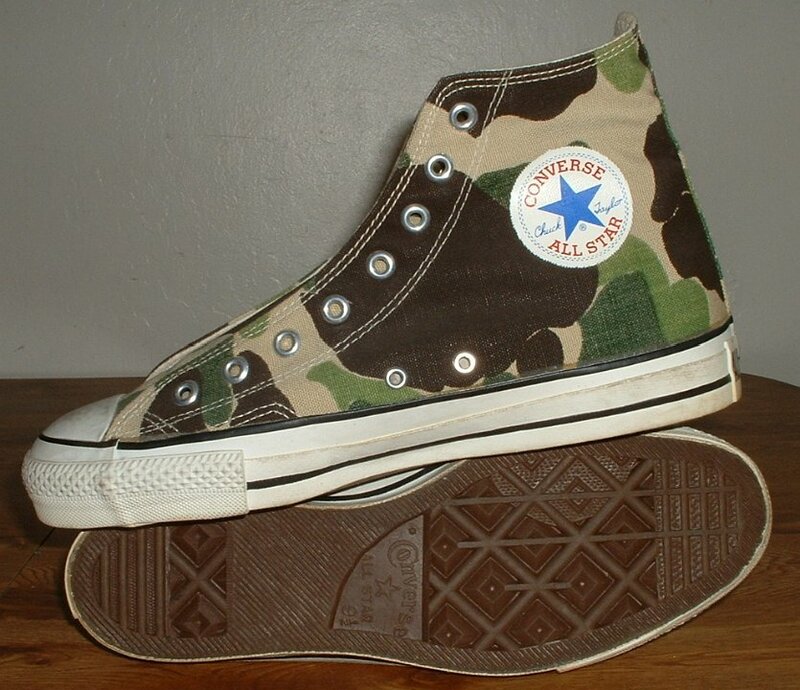 31 Mark Recob Vintage Chucks Collection Angled front view of olive drab camouflage vintage Chuck Taylor All Star high tops. 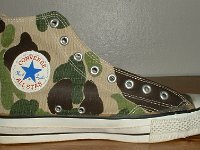 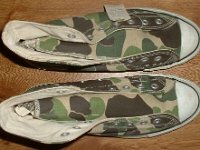 32 Mark Recob Vintage Chucks Collection Inside patch views of olive drab camouflage vintage Chuck Taylor All Star high tops. 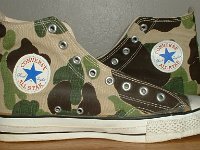 33 Mark Recob Vintage Chucks Collection Inside patch and sole views of olive drab camouflage vintage Chuck Taylor All Star high tops. 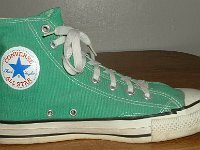 34 Mark Recob Vintage Chucks Collection Inside patch view of a right green vintage Chuck Taylor All Star. 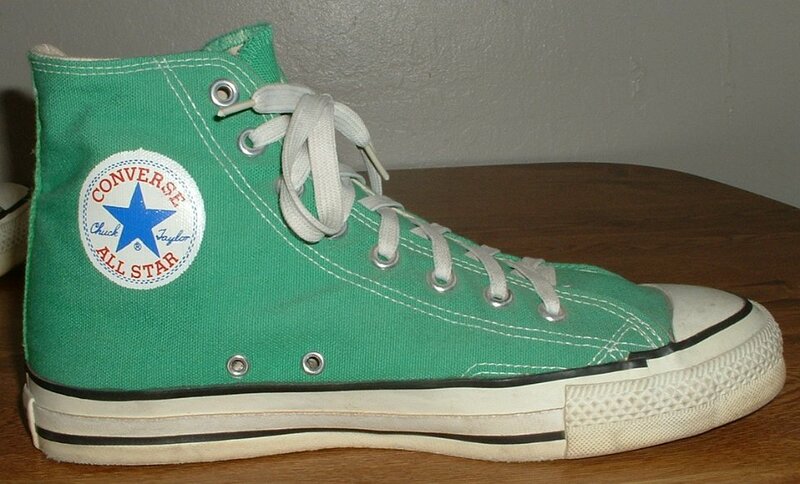 35 Mark Recob Vintage Chucks Collection Outside patch view of a right green vintage Chuck Taylor All Star. 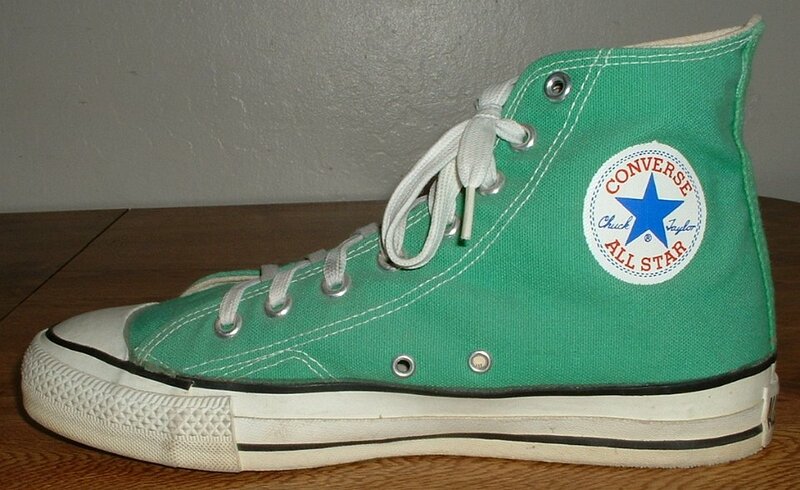 36 Mark Recob Vintage Chucks Collection Inside patch view of a left green vintage Chuck Taylor All Star. 37 Mark Recob Vintage Chucks Collection Outside patch view of a left green vintage Chuck Taylor All Star. 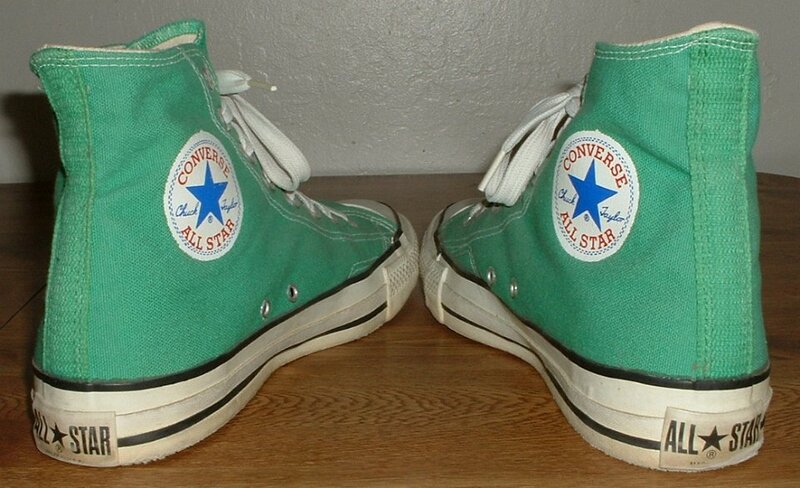 38 Mark Recob Vintage Chucks Collection Rear view of green vintage Chuck Taylor All Star high tops. 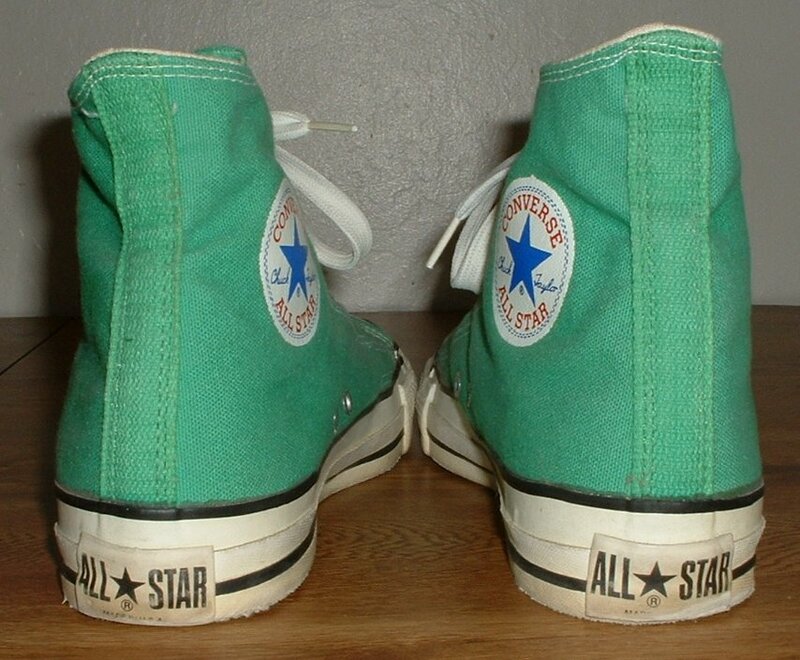 39 Mark Recob Vintage Chucks Collection Angled rear view of green vintage Chuck Taylor All Star high tops. 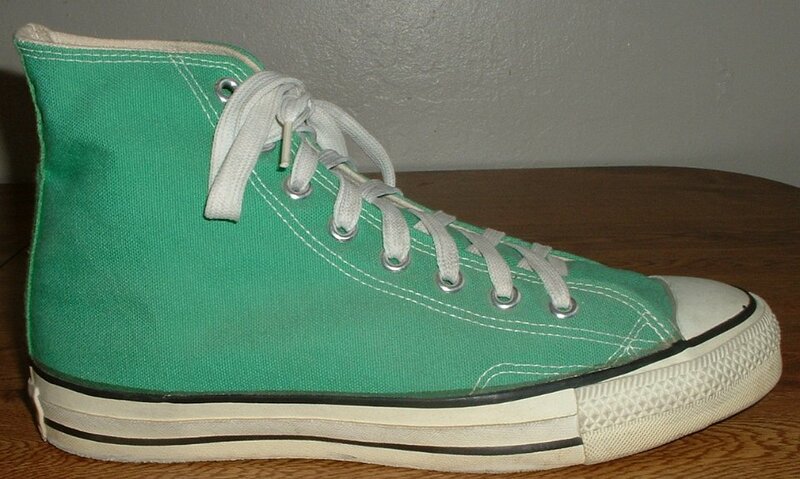 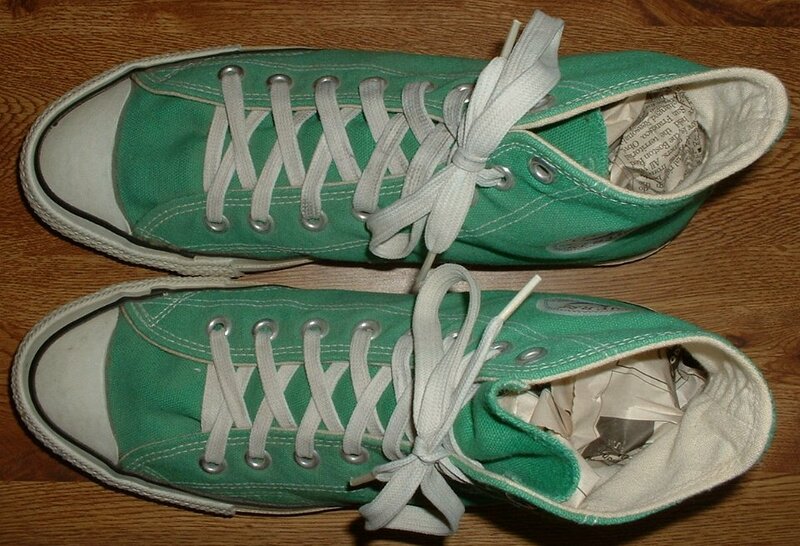 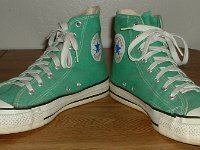 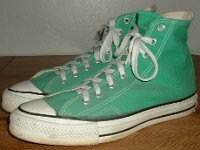 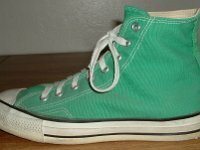 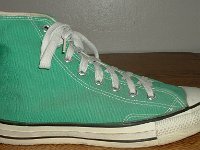 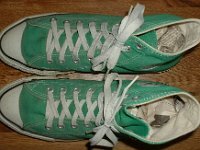 40 Mark Recob Vintage Chucks Collection Angled side view of green vintage Chuck Taylor All Star high tops. 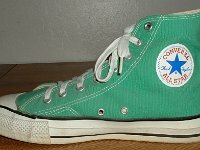 41 Mark Recob Vintage Chucks Collection Angled front view of green vintage Chuck Taylor All Star high tops. 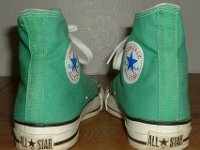 42 Mark Recob Vintage Chucks Collection Top view of green vintage Chuck Taylor All Star high tops. 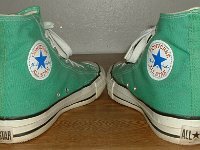 43 Mark Recob Vintage Chucks Collection Inside patch and sole views of green vintage Chuck Taylor All Star high tops. 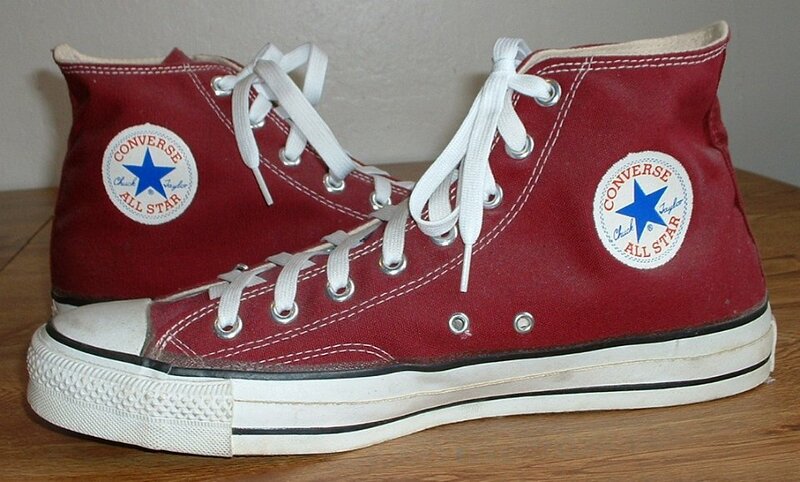 44 Mark Recob Vintage Chucks Collection Inside patch view of a right maroon vintage Chuck Taylor All Star. 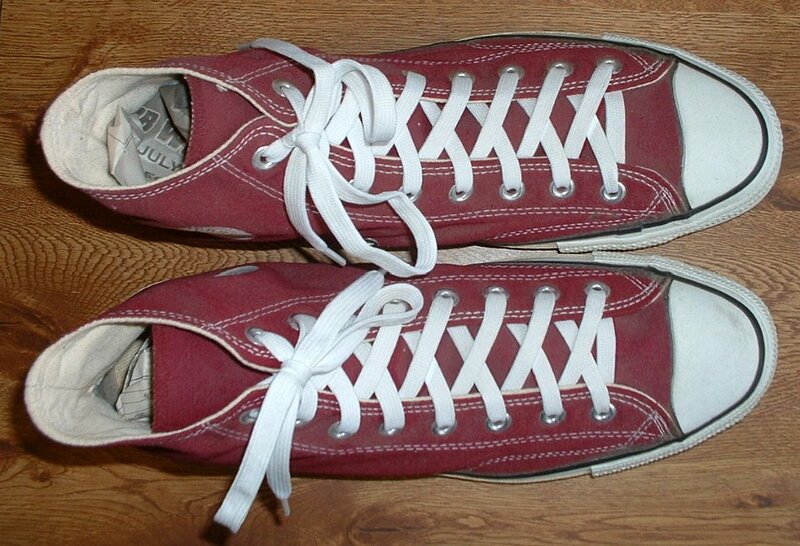 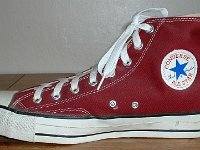 45 Mark Recob Vintage Chucks Collection Outside view of a right maroon vintage Chuck Taylor All Star. 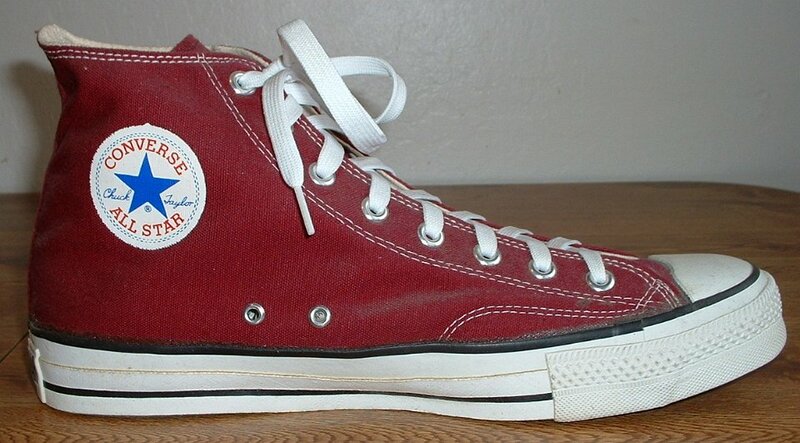 46 Mark Recob Vintage Chucks Collection Inside patch view of a left maroon vintage Chuck Taylor All Star. 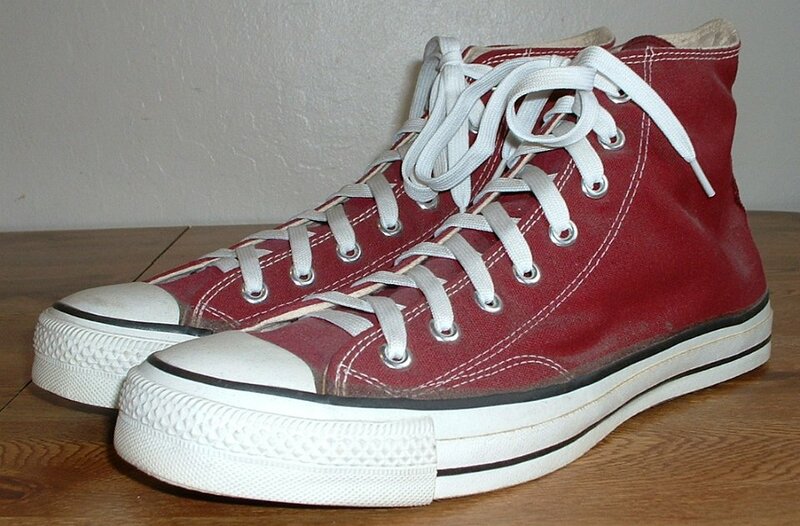 47 Mark Recob Vintage Chucks Collection Outside view of a left maroon vintage Chuck Taylor All Star. 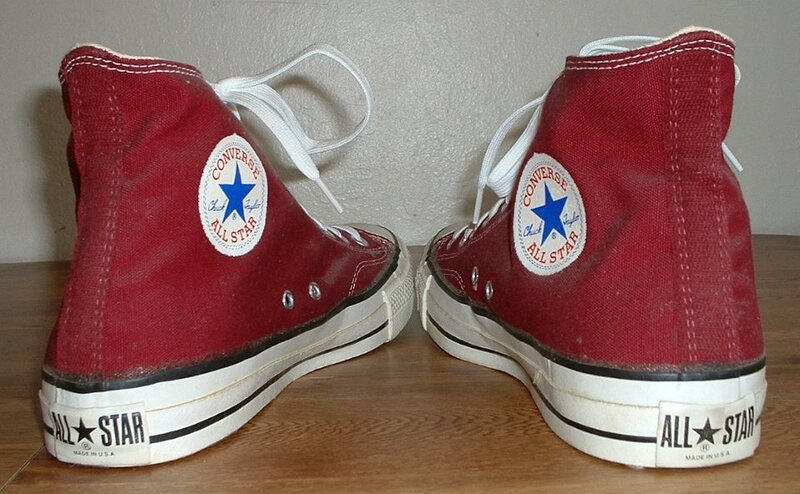 48 Mark Recob Vintage Chucks Collection Rear view of maroon vintage Chuck Taylor All Star high tops. 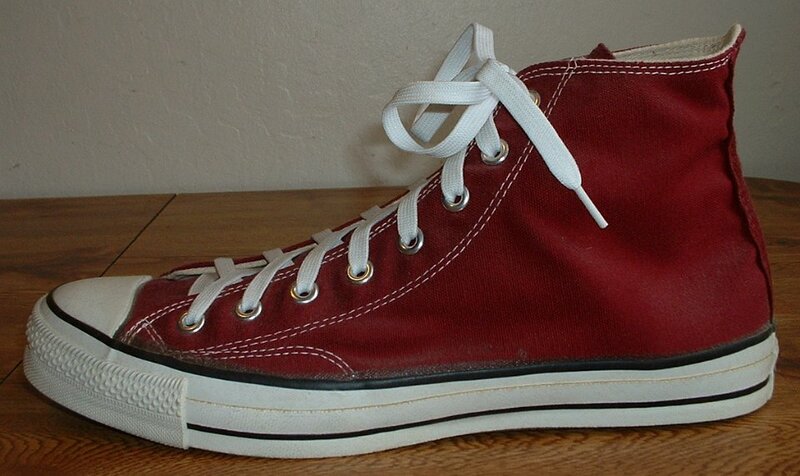 49 Mark Recob Vintage Chucks Collection Angled rear view of maroon vintage Chuck Taylor All Star high tops. 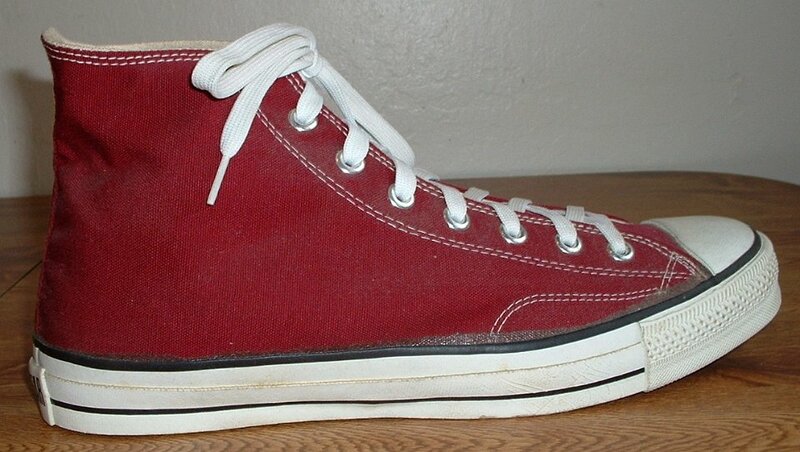 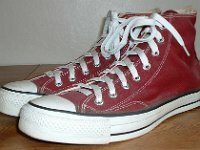 50 Mark Recob Vintage Chucks Collection Angled side view of maroon vintage Chuck Taylor All Star high tops. 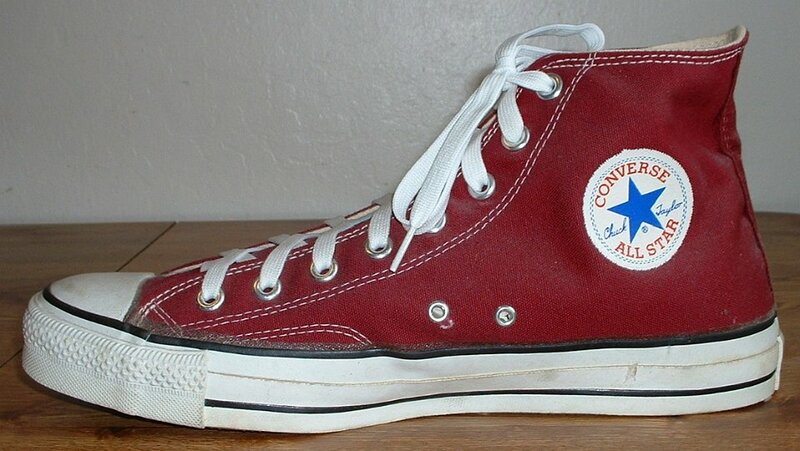 51 Mark Recob Vintage Chucks Collection Angled front view of maroon vintage Chuck Taylor All Star high tops. 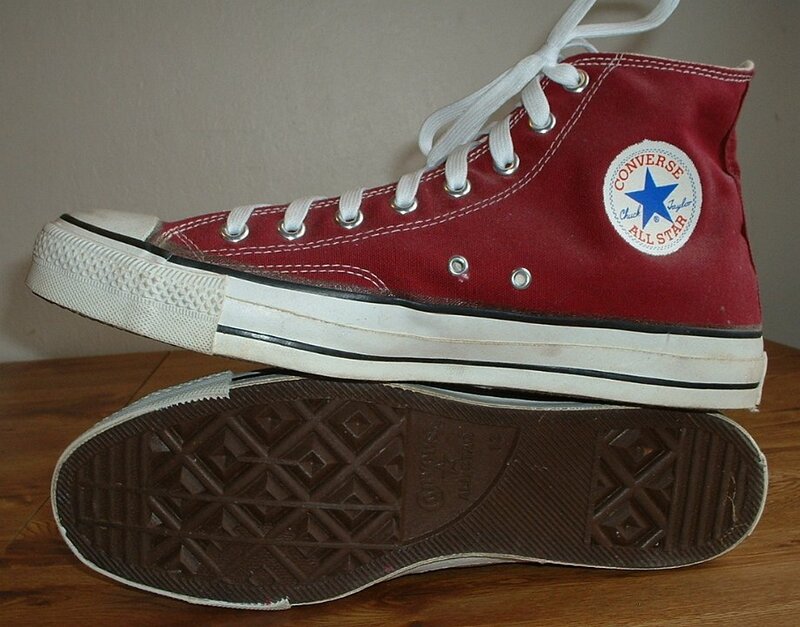 52 Mark Recob Vintage Chucks Collection Top view of maroon vintage Chuck Taylor All Star high tops. 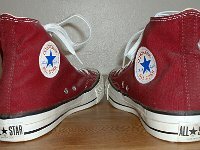 53 Mark Recob Vintage Chucks Collection Inside patch views of maroon vintage Chuck Taylor All Star high tops. 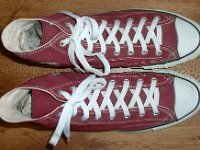 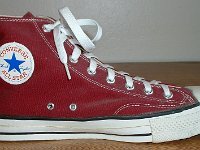 54 Mark Recob Vintage Chucks Collection Inside patch and sole views of maroon vintage Chuck Taylor All Star high tops.